"AUTHOR: THE JT LEROY STORY"
JT Leroy had one heck of a story. The best-selling author's tale involves abuse, deception, celebrities, scandal, and much, much more. All of it is recounted in the documentary Author: The JT LeRoy Story. Hearing a first-hand account of the events is absolutely riveting, but the real miracle of the film is that it challenges you to redefine how you see LeRoy. When he was revealed to be the fictional creation of writer Laura Albert, many screamed hoax. Author shows that such a label isn't entirely accurate. He was, in fact, quite real – just not in the way you might expect. Albert appears on camera to tell her own story: how she grew up troubled and insecure; how she found therapeutic comfort in writing from a male point of view; how she came up with the persona of “JT LeRoy,” a young male hustler with a prodigious gift for semi-autobiographical prose; and how she convinced her sister-in-law Savannah to don a wig and sunglasses to become the public face of JT. That's where the story gets really crazy. After the phenomenal success of the books Sarah and The Heart Is Deceitful Above All Things, JT turned into a phenomenon in the publishing world, with show business not far behind. Savannah-as-JT became close pals with everyone from Courtney Love, to Bono, to Good Will Hunting director Gus Van Sant. Albert, subsequently, had to invent another persona for herself, coming up with JT's British assistant Speedie. She stood on the sidelines, watching as someone else became beloved for the work she did. Very few people knew what was really going on. The Smashing Pumpkins' Billy Corgan was one of them. Eventually, a New York Times reporter caught on and penned an expose. Director Jeff Feuerzeig (The Devil and Daniel Johnston) adeptly weaves together Albert's on-camera interview, personal home videos, animated sequences, and audio recordings of phone calls to tell the story of how JT LeRoy rose and how the whole thing quickly fell apart once that reporter's piece was published. There are so many wild twists and turns to this tale, which ensures that Author is never anything less than hypnotic. It's a mind-blowing document of creation and deception, of a writer whose pure creative expression evolved into something far bigger than she expected or was equipped to handle. Every second of the film leaves you captivated as you see how the situation was born, bloomed, and ultimately collapsed under its own weight. What makes it so profoundly special, though, is that you come to view Laura Albert and JT LeRoy in a much different way than the media presented them at the time of the exposure. It's pretty clear that Albert had no malicious intent in creating the JT persona. The aim was not to fool people, con celebrities, or pull off some self-satisfied hoax. JT LeRoy may not have been a real person, but he absolutely existed as an expression of Laura Albert's emotions and ideas. He was the conduit through which she could fully explore her most heartfelt, deeply personal musings. Had she not invented him, it's more than likely that her brilliant work would not exist. And when the world demanded him in physical form, she made it happen. 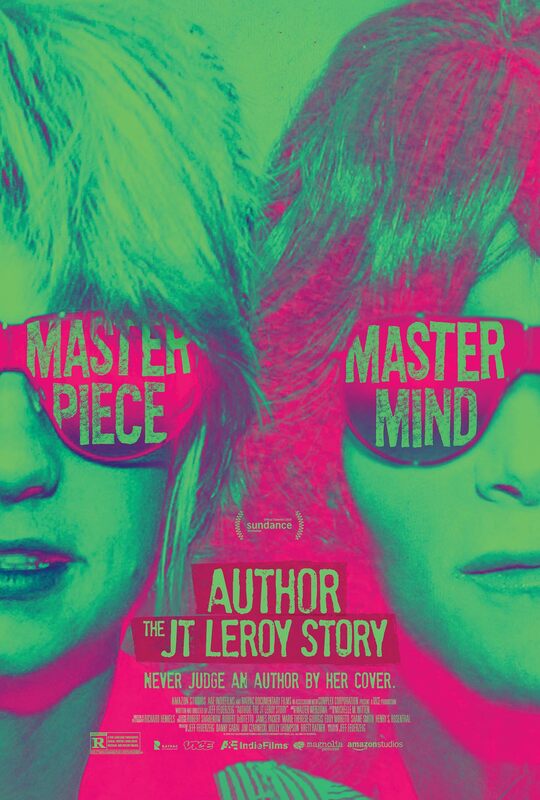 In some respects, Author: The JT LeRoy Story plays like a great thriller. Suspense mounts as you learn the intimate details of JT's rise and hear the personal repercussions of his fall. And underneath it all is a surprisingly moving testament to the power of creative freedom. Laura Albert couldn't say certain things as herself. JT LeRoy provided a mechanism for those ideas to emerge. He was an invaluable writing tool. People were affected by the work in a way that rarely happens. In the world of literature, isn't that important above all else? Feuerzeig's documentary argues, convincingly, that Laura Albert wasn't a liar, she was a truth-teller. Her stories got at themes that impacted readers. JT LeRoy wasn't fake. He was a real writer who just happened to exist within somebody else's psyche. Author lets us get to know both of them. It's one of the most captivating documentaries you'll see. Author: The JT LeRoy Story is rated R for language throughout, sexual content, some drug material and violent images. The running time is 1 hour and 52 minutes.